As promised, here are the finalists for the 2019 YALSA Excellence in Nonfiction Award. As with the Morris Award nominees, I’ve read all the titles. They, too, will be announced at the Youth Media Awards in Seattle. These authors will also present at the same ceremony as the Morris finalists. My heart is with Hey Kiddo, which I wrote about here. I am also excited to see Faithful Spy on the list. You can read more about all five finalists on the 2019 YALSA Excellence in Nonfiction Award page. Almost everyone I know is relieved at the weather change. Fall seems to be back: they sky is grey and it seems to have rained overnight. A big El Niño debate is raging: will it be really rainy or really cold? 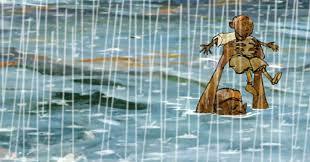 One of my first winters in Portland, an El Niño year, it was so rainy they sand bagged downtown for fear the Willamette River would overflow. It didn’t, but floods certainly happened in outlying areas. 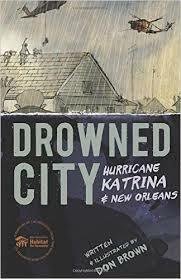 This gets me thinking about Don Brown’s new nonfiction book Drowned City: Hurricane Katrina & New Orleans. This is a stunning graphic chronicle of the tragedy that hit New Orleans in 2005. 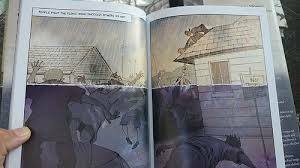 As with The Great Dust Bowl, the illustrations are powerful and the text combines facts and details that attest to wide research and reading on Brown’s part. Brown does not shy away from telling the hard parts of this story, in addition to the heroic. 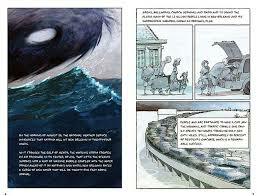 Graphic nonfiction makes for an easy way to build students’ background knowledge of events that happened before they were born or before they can remember. This book will be an excellent addition to any classroom library.